permanent within the meaning of § 14 BGB. 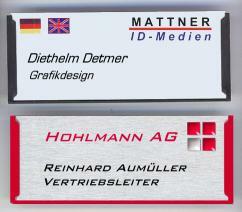 This moulder and sportily active nameplate in the format of 75 x 30 mms is suitable for all areas. suitable paper investors on A4 curves-used. The Signs are protected by a highly clear Perspex disc. Alternatively to the paper investors we deliver printed PVC signs in white, or gold, silver, Bronze-metallic.